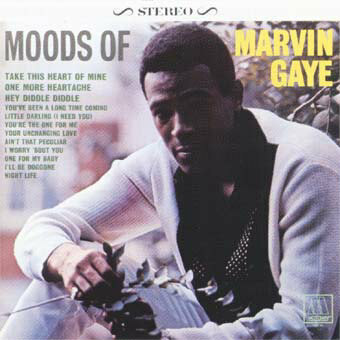 Moods of Marvin Gaye is a 1966 album recorded by Marvin Gaye for the Tamla (Motown) label. The album's plan was to establish the singer as a strong albums-oriented artist, as well as a hit maker, although Gaye was still uncomfortable with performing strictly R&B. He had begun work on a standards album around this time after meeting musician Bobby Scott. However, sessions were unsuccessful and it would only be later in Marvin's career in which Marvin successfully completed a standards album though it'll later be released after his death. For the time being, Gaye was winning more fans, and had become a crossover teen idol. Six of the Mood of... album's songs were released as singles: impressively all reached the Top 40 on the R&B singles chart and four of them reached the Top 40 on the Pop Singles Chart, a rare feat for a solo R&B artist even at that time. Gaye also scored his first two #1 R&B singles, "I'll Be Doggone" and "Ain't That Peculiar", both co-written by Gaye's friend, Berry Gordy's right-hand man Smokey Robinson.